Kilkenny more than any other Irish city has a distinctively medieval feel about it. Its small streets wind around several medieval buildings whilst its skyline is still dominated by a 13th century castle and cathedral. Through some of these buildings we can reconstruct the major events of the city’s past from witch trials to the black death. 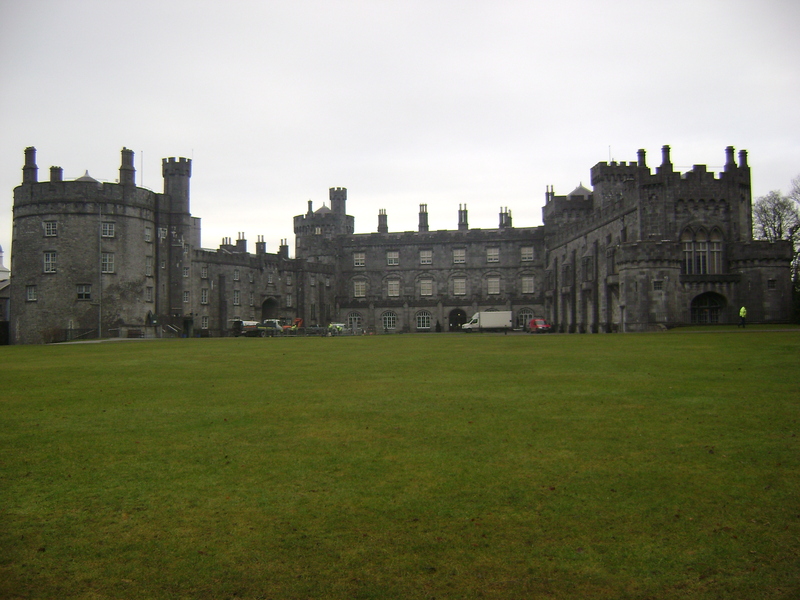 Kilkenny was the primary inland settlement in Ireland during the medieval period. 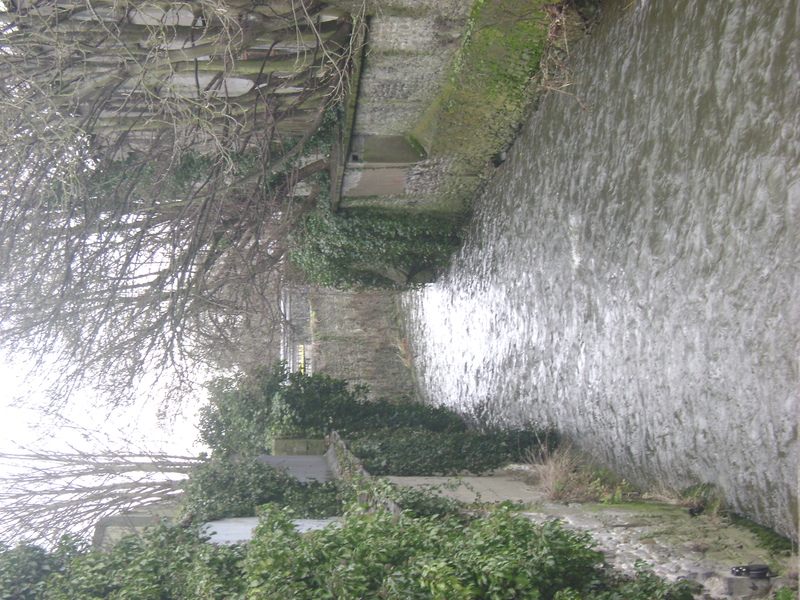 Its importance was down to its location situated on the important Nore river. It is also situated ideally between coastal towns of Dublin, Cork, Waterford and Wexford. St Canices Cathedral. Site of the early medieval settlement. Round tower can be seen to the left. 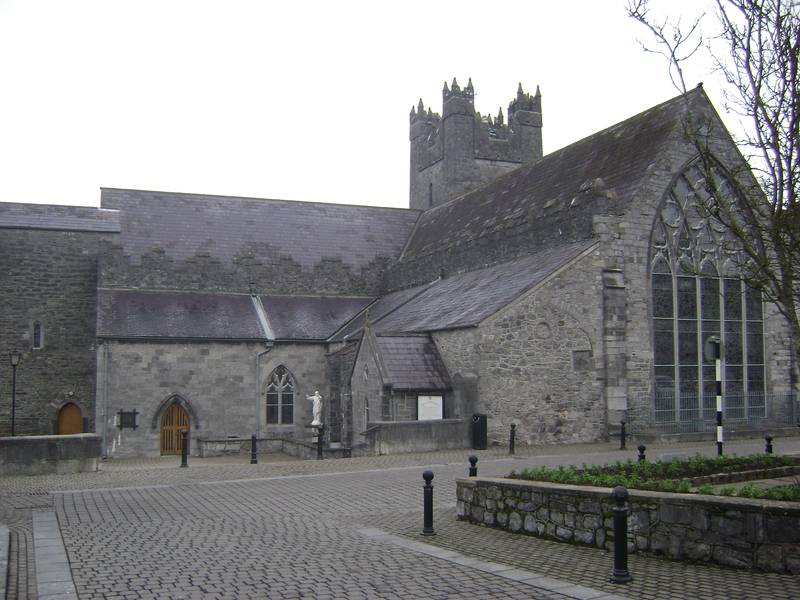 The city’s origins lay in the early medieval period as an ecclesiastical settlement founded by St Canice. 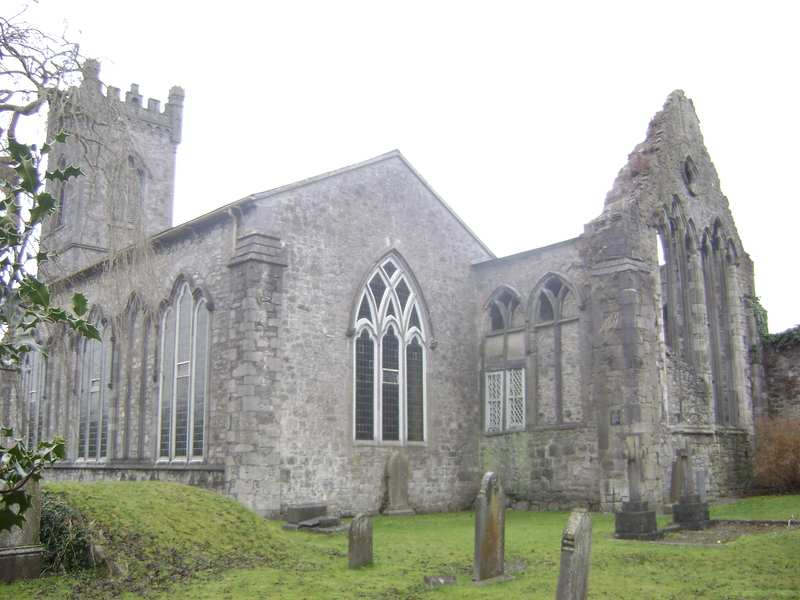 The Irish name for Kilkenny is Cill Chainnigh meaning the church of Canice. This early monastic site was replaced by the far more impressive structure of St Canices cathedral in the 13th century (work started in 1205). The only reminder of the monastic settlement is the round tower seen in the right of the photograph. This tower was constructed originally in the 10th century but was substantially renovated in the 19th century. 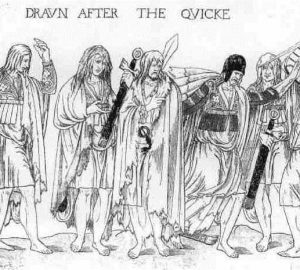 In the late 12th century Ireland was fundamentally changed by the Norman invasion beginning in 1169. 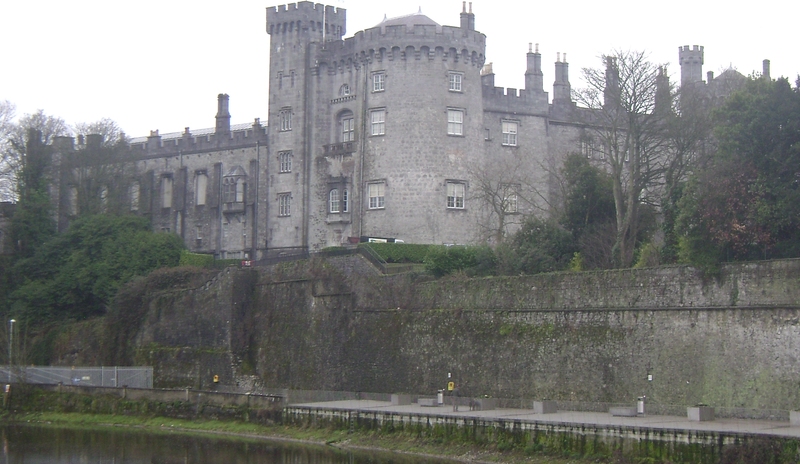 Kilkenny quickly became an important Norman settlement and this dramatically changed the town. 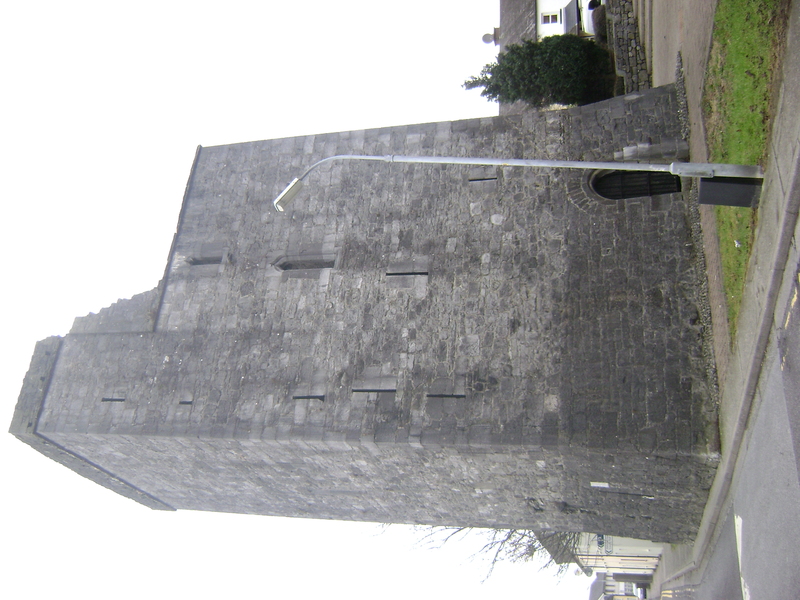 William Marshall (son-in-law to Strongbow) built the first stone castle in Kilkenny on an elevated site south of the original monastic settlement. 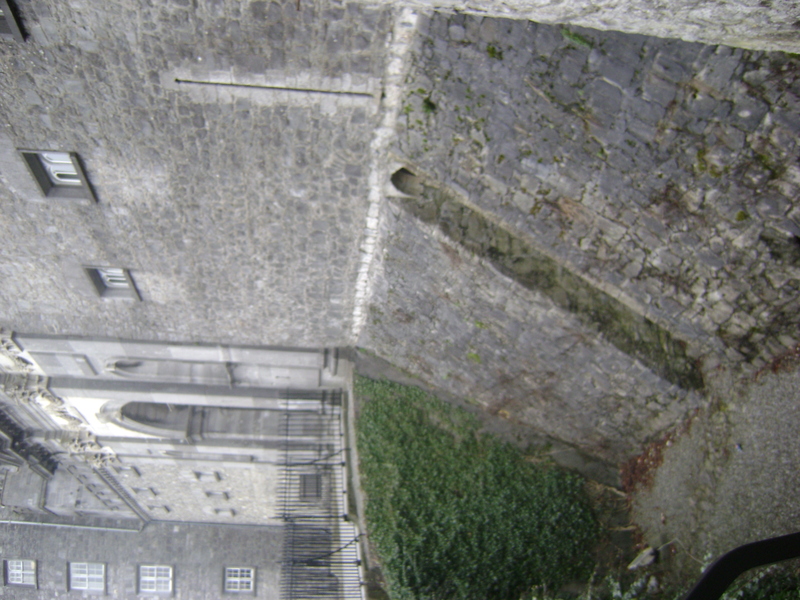 The photo to the left shows a section of the original moat which was excavated by archaeologists in the late 1990’s. The castle was extensively remodeled in the course of the 18th and 19th centuries under various members of the Butler family who resided in the castle from 1391 – 1920. Through these renovations it was converted from a military fortification into a stately home. This saw the moat filled in and much of the surrounding lands around the castle landscaped. By the mid 13th the town was wealthy enough to levy a murage tax (taxes for town defenses) and a wall was constructed around the settlement. The best surviving section of these walls survive at the recently renovated Talbots tower on New St and the Black Freren Gate beside the Black Abbey on Abbey Street. The structure of the Black Freren Gate standing today (left) is not an original 13th century structure but a 16th century renovation. Through the 13th century the settlement boomed attracting several monastic orders including the Dominicans, Franciscans and the Augustinians. 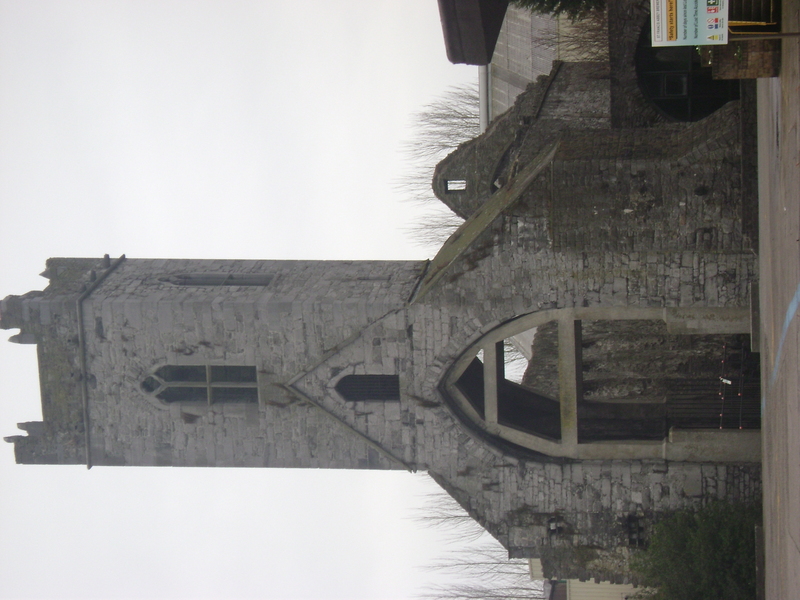 The Augustinians built a priory on the Eastern side of the river Nore – St Johns Priory, around which a suburb grew through the middle ages known as St John’s. The most famous was the monastic institution was the Black Abbey (left) home to Dominicans founded in 1225. 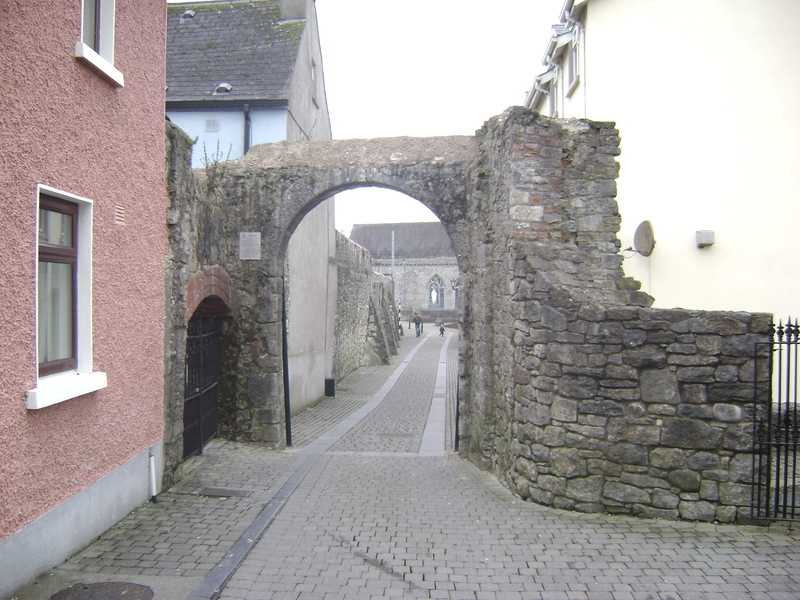 Medieval Kilkenny was segregated between an High town and an Irish town divided by a wall. This wall has long since been demolished only preserved today by the course of the river bregagh (left) which alongside the wall was built. 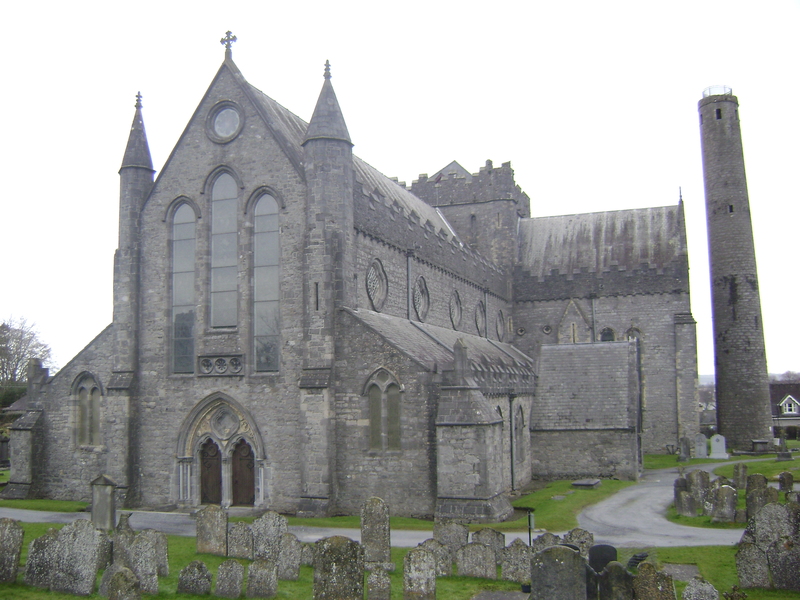 The Irish town was the area from the Breagagh river to St Canices cathedral and as the name suggests was where the “Irish” lived. 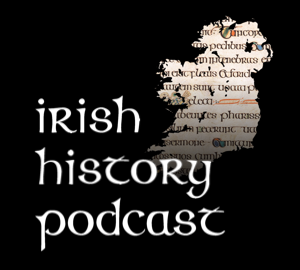 Over the centuries, what the powers that be defined as “Irish” changed, as various settlers became increasingly gaelicised. In 1324 Kilkenny witnessed what is regarded as the first of the witch trials that swept across Europe between the 14th-18th centuries. These saw hundreds of thousands of people mainly women executed. Alice Kyteler and a number of her associates were tried and convicted of witchcraft. Although Kyteler escaped her servant Petronella Di Midia was publicly burned to death in November 1324 . Here’s a link to a podcast I made on this trial. The 14th century saw a dramatic decline in the cities fortunes. 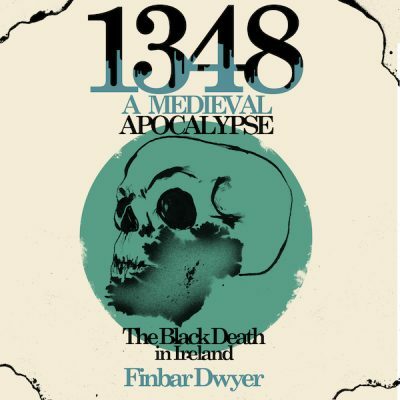 War, deteriorating climate and eventually the arrival of the Black Death in 1348 damaged the settlement economically and demographically. These events were famously chronicled by Friar John Clyn a Franciscan Friar. He wrote his account at the Friary of St Francis pictured to the left, the ruins of which are situated in the middle of the modern Smithwicks Brewery. Clyn died in 1349 presumably from the Black death. 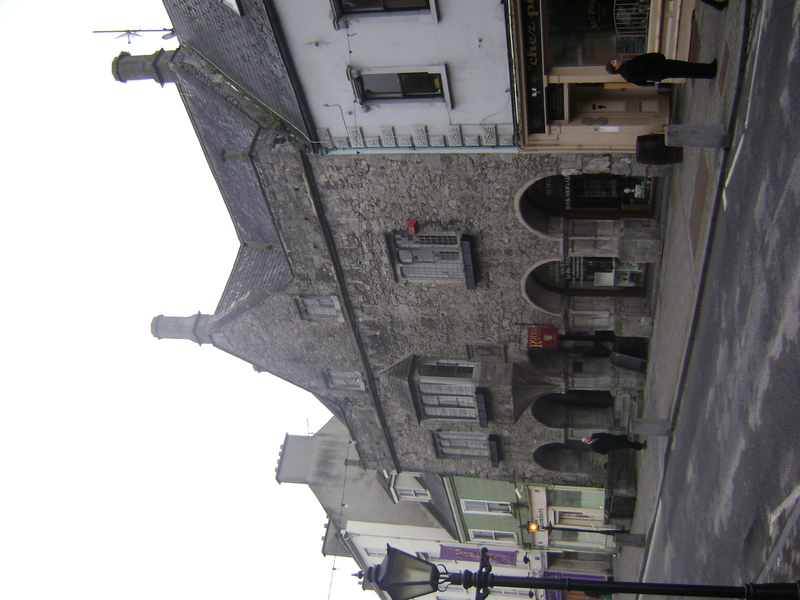 Kilkenny’s wealth through the entire medieval period was largely down to trade. This rise in trade in the medieval era was accompanied by a rise in the spread of diseases. The black death was one but there were many others. A reminder of this can be seen in the Maudlin tower on Maudlin street, a medieval hospital which cared for people suffering from leprosy amongst other illnesses. The tower house was built in the late 16th century on an earlier building. The Black Death irreparably damaged the medieval economy and society. Over the following three centuries this medieval world gave way to what historians call the early modern world. Capitalism began to replace the medieval economy as merchants rose in power. This change can be seen in Kilkenny’s streets. The old powers of medieval society lost power and influence most notably the monastic orders which were suppressed in the 1540’s under edict of Henry VIII. The monastic institutions fell derelict. Below is the ruins of the St John’s priory, part of which was converted into a protestant church in 1817 (the renovated section is in the foreground). The end of the Medieval Era. By the end of the 16th new buildings in the city reflected the change in power. With the large monasteries that once dominated the city in ruin the new dominant buildings were the family homes of the cities rich merchants reflecting their increased status and power. The best example of this is Rothe House (built between 1594 and 1610). This was home to the famous Rothe family who dominated Kilkenny political life for centuries. The final blow to the remnants of the medieval world in Ireland was the arrival of Cromwell and the English Army in the 1649. 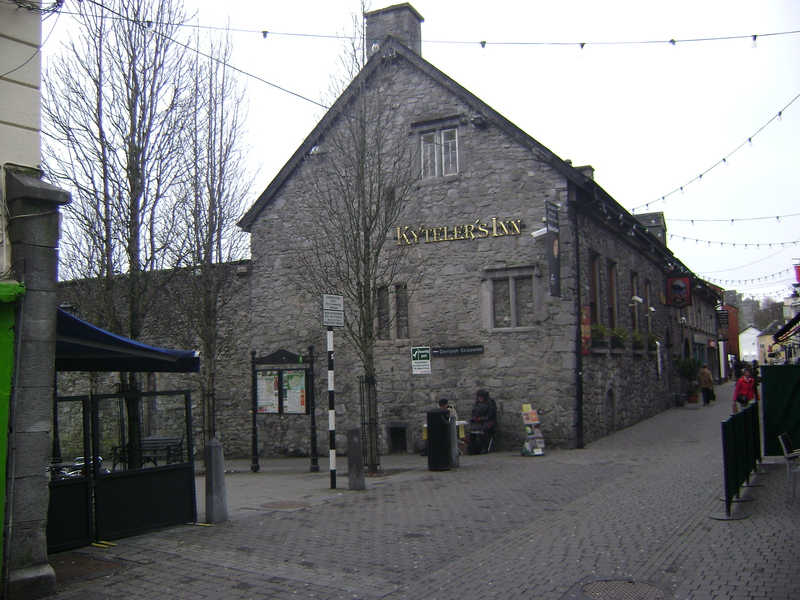 Kilkenny had been the capital of a confederacy which supported the king in the English civil war against the parliamentary forces lead by Cromwell. When Cromwell arrived at Kilkenny the city refused to surrender. Cromwell subsequently attacked the castle destroying the Southern side which included the original gatehouse giving the castle its distinctive three sided shape today. Over the next fifty years Ireland was dramatically reshaped through a series of plantations and settlements ending of the last vestiges of medieval Ireland. In Kilkenny city in 1740 Matthew Ryan a local highwayman pretended to be mute. No one believed him so in the market square they decided to crush him under some rocks. “As the weights were on the wretched man earnestly supplicated to be hanged but it being beyond the of the sheriff to deviate the mode of punishment prescribed in the sentence even this was an indulgence which could no longer be granted to him”. Kilkenny might be overrun with stag nights nowdays but they are a damn sight better than watching a man getting slowly crushed. The market is now the car park just behind Kilters pub where the famous witch lived.